ENGLAND'S Matt Fitzpatrick remained firmly in contention to add a first PGA Tour title to his impressive CV in the Arnold Palmer Invitational as Rory McIlroy struggled to find his best form. Fitzpatrick shared the overnight lead at Bay Hill and added a second round of 69 to his opening 67 to reach halfway at eight-under par, two behind American Charley Hoffman. Paul Casey was four shots further back after a 72, with Olympic champion Justin Rose recovering from bogeying his first three holes to finish alongside compatriot Tyrrell Hatton and defending champion Jason Day on three-under. World number three McIlroy safely made the cut after adding a 71 to his opening 74, but he will tee off his third round on Saturday only tied for 46th, 11 shots behind Hoffman. Tommy Fleetwood followed a 78 with a superb 66 to get back to level par. Fitzpatrick was the leading amateur in the 2013 Open at Muirfield and won the US Amateur title a month later, before making a successful transition to the paid ranks in 2014. Victory in November's DP World Tour Championship came two years to the day since he gained his card via the qualifying school and saw Fitzpatrick eclipse Nick Faldo's record as the youngest Englishman to win three times on the European Tour. It also gave him the security of a five-year exemption on the European Tour and a PGA Tour card is the next goal for the world number 30, who carded five birdies and two bogeys in his 69. "I'll probably move over next year to be honest because that's where I want to be in the long run," said Fitzpatrick, who laughs off the occasional problem caused by his youthful appearance. "I'm sure probably people think I'm the amateur out there or the 15-year-old that's got in or something. But I don't mind that, I think it's quite funny. "I would rather that than people think, 'Oh, he's going to win every week.' I can't really imagine the sort of pressure that Rory and Jason Day and those guys have – it's probably tough to keep up with." Fitzpatrick, who was seventh in the Masters last year and made his Ryder Cup debut at Hazeltine, followed a birdie on the second with his first bogey of the week on the fourth, before adding four birdies and a bogey on the back nine. Making just his third start of 2017 due to a rib injury, McIlroy bogeyed his first two holes after a wild tee shot on the 10th and another errant drive on the next, but bounced back with a birdie on the 12th and an eagle on the 16th. However, the 27-year-old promptly found water with his tee shot on the 17th to give both shots back, before completing an eventful nine holes with a birdie on the 18th. 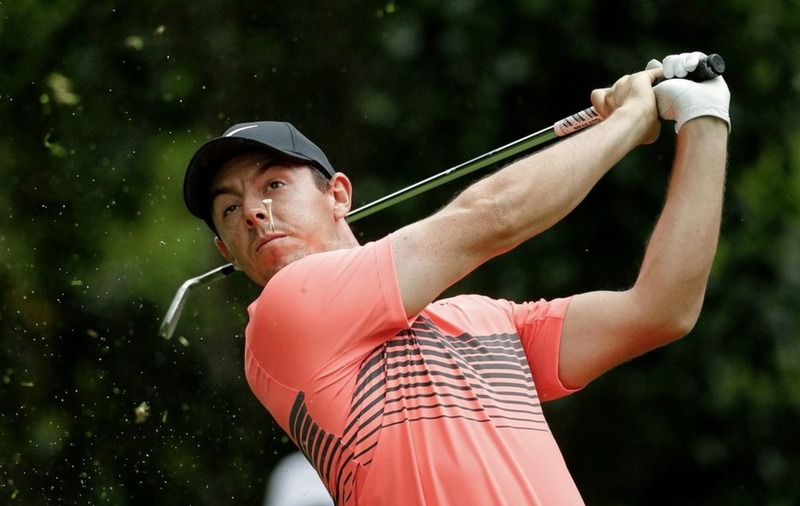 The front nine was a more sedate affair as McIlroy recorded a solitary birdie and eight pars to finish one over par. Graeme McDowell is also safely in for the weekend after adding a 71 to his opening 72 to finish one-under and tied for 26th. Halfway leader Hoffman would not have played at Bay Hill if not for missing the cut last week in Tampa to drop from 68th to 71st in the world rankings, taking him out of the field for next week's WGC-Dell Technologies Match Play. "All in all, I think that it's probably a better decision to play this week than to have played match play and play those long, gruelling rounds," Hoffman said, after a 66 which gave him a one-shot lead over Argentina's Emiliano Grillo. "I've got a big stretch coming up, so I obviously would have loved to play the World Golf Championship, but I'm not overly disappointed."